I'm a big fan of Doctor Who. Like most Whovians, I don't like every single episode. I have my favorites, just like I have my favorite Doctors and my favorite companions. So what exactly makes Doctor Who so great? And what exactly is Doctor Who? Doctor Who is a BBC science-fiction series that has been around for over 50 years--even before I was born--although there was a long break between the late eighties and 2005 when the new series began. Doctor Who tells the ongoing story of the Doctor: a Time Lord from the planet Gallifrey and the last of his kind. The Doctor is hundreds of years old, and he’s seen a lot of terrible things. He has a lot of enemies, like the Daleks and the Cybermen. He’s lost a lot of friends along the way, which makes him very lonely. That’s why the Doctor likes to take people along for the ride. These special people are the Doctor’s companions. They get to travel with the Doctor is his time machine, which is called the TARDIS. TARDIS stands for Time And Relative Dimension In Space. On the outside, the TARDIS looks like a blue police call box from England in the 1960s. It’s much bigger on the inside, though. Sometimes bigger than others. The Doctor’s real name is a secret he must keep, because if it falls into the wrong hands… Actually, I don’t know what would happen, but apparently it’s something really bad. When the Doctor dies, he regenerates and turns into someone new. So far 13 actors have played the Doctor, and each one has brought something different to the role. Anyway, remember how I said that the TARDIS is bigger on the inside? Well, I think that what makes the show great is that the show itself is bigger on the inside. The show makes you feel, and it makes you feel BIG time. For example, I’ve never seen a more romantic couple on TV than the 11th Doctor’s companions, Amy Pond and Rory Williams. He dies over and over for her, and as the Last Centurion he waits over a thousand years to guard her in the Pandorica. And when Amy has to choose between Rory and all of time and space, she chooses him. “Together or not at all.” Try to beat that, any other TV couple out there. Looking for something scary? Try the episodes entitled “Blink,” “Silence in the Library,” “The Time of Angels,” “Flesh and Stone” and finally “The Angels Take Manhattan.” I don’t know of any other show that’s made thousands of viewers too scared to even blink. And that’s what makes Doctor Who so great! It makes you feel so much and so deeply. You fall in love with the characters. You feel their terror and sadness and joy. In a way, everyone who watches Doctor Who BECOMES the Doctor’s companion. We’re all onboard the TARDIS for this wonderful, scary, funny, exciting ride! So it’s not that the show can be anything; it’s that the show can take your emotions ANYWHERE, and it does. There's a lesson there for any storyteller: don’t let the audience half feel things. Go as far as you can. Make your story like a TARDIS: bigger on the inside. 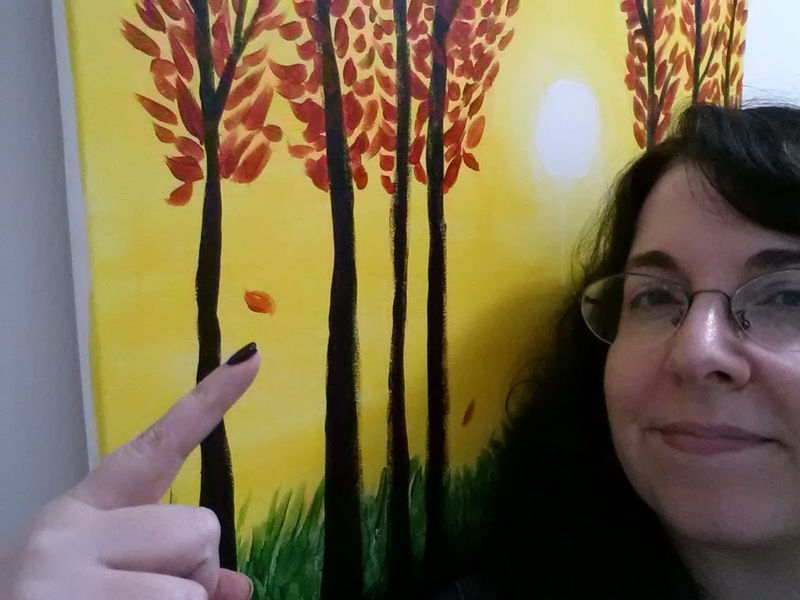 At the 2015 New York ComicCon, I attended a panel called “Geeking the Stacks.” It was about libraries and graphic novels for kids and teens, and I found it very informative. One thing I learned is that kids today LOVE graphic novels, so much so that one of the publishers at the panel said, “Send us your graphic novels. We can’t publish them fast enough!” There aren’t that many people out there who can write and draw well in the graphic novel format and who are interested in creating books for kids and teens. If that’s you, you’re in luck! The librarians talked about what seem to be the most popular graphic novels among kids and teens. Here are just three of the ones that I also love: Smile, El Deafo, and Baba Yaga’s Assistant. 1. 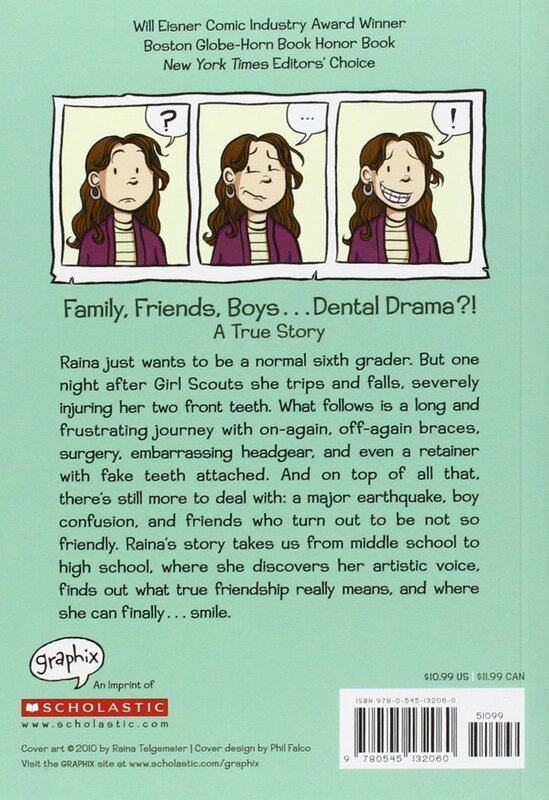 Smile by Raina Telgemeier tells the personal story of one girl’s experience with braces. 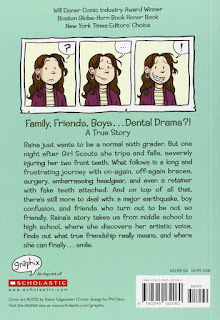 Raina explains that while she needed braces to fix an overbite, she REALLY needed braces after an accident knocked out her two front teeth! I really liked Smile, because I could relate to Raina. Not only did I need braces, but I know what it’s like to have friends who aren’t your friends at all. I also know the courage it takes to let go of a bad situation when it’s the only one you’ve ever known so that you can find new friends, nerd friends like you who love the same things you do and will support you instead of pressuring you to be someone you're not. 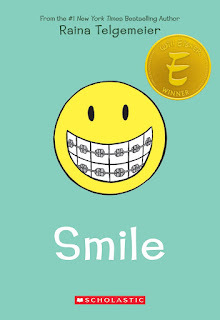 Smile has won several awards, and I can see why. 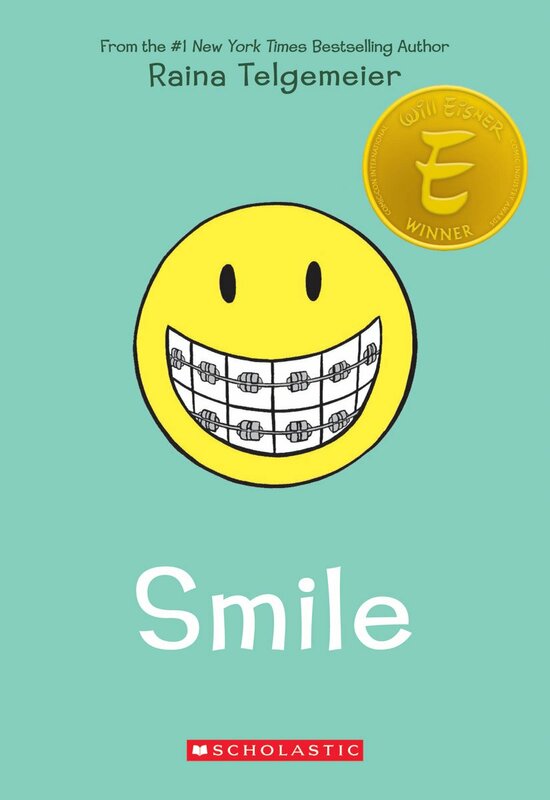 This is a perfect graphic novel for teens and preteens dealing with braces and negative peer pressure. I love it! 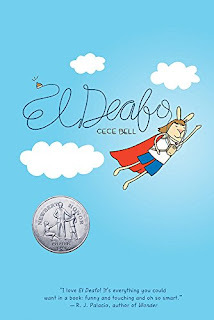 El Deafo is great, because it shows that deaf kids are just like other kids. They just want to have friends, especially a best friend. They aren’t perfect, and they don’t want to be treated differently because they’re deaf. Cece also explains some of the struggles of being deaf that most of us hearing people don’t know anything about, like the difficulty of going to a sleepover party when you can’t read lips in the dark. Cece isn’t perfect, and she doesn’t always make the right choices, but that’s okay. What real kid does? El Deafo has also won several prestigious awards, and it’s no wonder why: El Deafo rocks! 3. 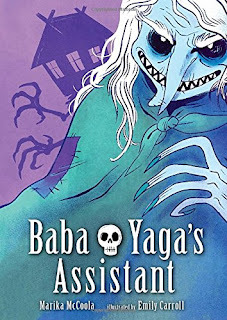 While the other two books here are essentially memoirs in graphic novel form, Baba Yaga’s Assistant by Marika McCoola and illustrated by Emily Carroll is a fantasy that brings the legend of Baba Yaga into a modern-day setting. Baba Yaga is a witch in Russian fairytales. Sometimes she's bad, but most of the time she’s scary and harmless, at least when it comes to kids who are kind and clever. The main character, Masha, is both. Her father is about to remarry, and while her future step-mother seems okay, her future step-sister is a little brat who likes to bite people. But that's not the only reason why Masha is unhappy. Recently, her beloved grandmother died, and Masha misses her a lot. Masha's grandmother used to tell her stories of her fantastic adventures with Baba Yaga, so when Masha finds a want ad from Baba Yaga, she jumps at the chance to become the witch's assistant. Will it turn out to be everything that Masha hopes, or will she get turned into Baba Yaga’s supper? And if Baba Yaga does like her, will Masha choose to stay, or will she change her mind and return home? You'll have to read the book to find out. 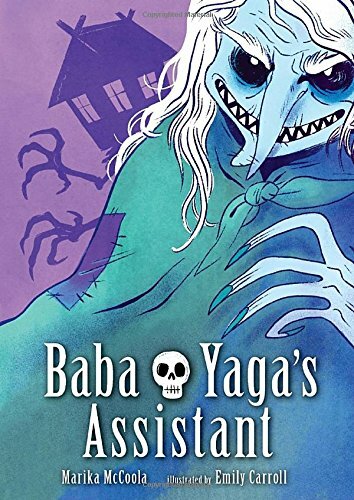 I’m familiar with Baba Yaga from other children’s books, but I really like the modern-teenage take in Baba Yaga’s Assistant. Masha is plucky, kind and resourceful, and I’d love to read more books about her. I highly recommend this book for kids and teens who prefer graphic novels with elements of fantasy and some scares, but nothing too scary. 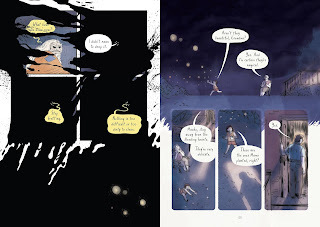 Masha is a great main character, the art is beautiful, and the story seems to hit all the right notes. I love it! These aren’t the only graphic novels for kids and teens that I love, but I think these three are a good start for anyone who wants to give this genre a try. And remember: if you love something, say something! Is It Possible to Make Your Childhood Dreams Come True? When I was little, the thing I enjoy doing most of all was creating worlds with my older sister and younger brothers. Our building blocks were made of wood, plastic, and pretty much anything else we could get our hands on. We made pirate ships out of Tinker Toys, and cities out of blocks and plastic tracks for toy cars. We populated them with plastic soldiers and plastic animals. But these weren’t just toys in my mind. Assembling these worlds was only the first step. When everything was ready, the stories began. A zebra could be a queen, a soldier a king. And the stories that could grow out of them were as endless as childhood days. Already back then, I knew what I wanted to do when I grew up: I wanted to create worlds. The next best thing in my mind then was to create worlds by making movies or TV shows. After all, filmmakers get to create worlds that have a physical reality. You can see a movie. You can hear it. And what you see and what you hear are determined by the creators of that movie. I wanted to be one of those creators. I discovered that to the most part filmmaking is a collaborative process. I might have a vision of this world that I want to create, but if I try to turn that into a movie I’ll have to deal with many other people who will want to impose their vision of what this world should be. And I didn’t want to have to deal with people like that. Sure, collaborating was fun when my sister and my brothers generally agreed about the rules of the stories we were creating. But it wouldn’t have been at all fun if someone had grabbed the toy zebra and said, “Don’t be ridiculous. A zebra can’t be a queen! So for a while, I locked the part of myself that wanted to create worlds away. It’s not that I stopped creating stories; I could no more do that than a singer could give up singing or a dancer could give up dancing. Creating stories is a part of who I am. I do it from the time I wake up to time I fall asleep. But I gave up on the idea of sharing my stories with others. I watched them play on the little screen in my mind. My characters made me laugh and cry and smile, and that was enough. Life went on. Writing and drawing turned into things I did for newspapers and magazines, things I did for a living. And I loved it, until I had to quit when we moved back to the USA so that we could find a better school for my autistic son. Without a job, I had to ask myself what I wanted to do. And then I remembered how I felt when I was a little kid building worlds out of wooden blocks and plastic toys. I remembered wanting to create worlds. And I thought about all those worlds that were already a part of me. Those characters had given me so much. What if there were others who needed these stories and these characters as much as I did? So I decided to write those stories down and share them with the world. I love writing stories. It makes me happy. I love spending time with Toren the Teller, Gilbert and Amber from the Legend of Gilbert the Fixer, and most of my other characters. I also love sharing them with you. When Gilbert says something that makes me laugh, I get a second smile on my face, just thinking about how it’s going to make you laugh, too. There’s no way I’m giving that up. But lately, I’ve been thinking about that dream that I gave up on, my dream of being a filmmaker. When I was a teenager, there was no such thing as YouTube. My sister, my younger brothers and I sometimes made short videos. We lip-synched “We Are the World.” (My sister did a great Bob Dylan.) We played with perspective, so my brother could stand on my hand. We used stop motion to make a Play-Doh snake swallow a plastic tank after the tank ran over it. I remember one stop-motion piece I made on my own with scissors dancing in what looked like a ballet. These videos were so much fun to make, but probably not more than a dozen people got to see any of them, and I have no idea where they are now. Nowadays, though, anyone can make a video and share it with the world. I couldn’t make my dream come true back then, but is there really anything stopping me now? So I went out and bought the equipment. I’ve got a brand-new video camera, and even a teleprompter. And I’m excited! I’m going to be making videos, and I have so many ideas for them. I plan to create a channel where I talk about the things I love: movies, tech, TV shows, books, games, and more. Too often great things disappear because not enough people hear about them. I want to try to make a difference, and I want to use video to do it. I know it’s not the same thing as creating worlds, but the worlds I create are still too big for the kind of budget an amateur like me can afford to produce on video. That’s okay, though. Like I said, there’s no limit to how big a world I can create on paper, and I plan to continue doing just that. Is there something you loved doing when you were little or something you wanted to do when you grew up? If so, what’s stopping you from doing it now? It doesn’t have to be big. Just take a small step in the right direction. 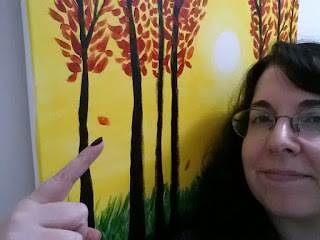 The painting I made at Make Me, Take Me. It's not a fine work of art, but it was fun to make and I like it. If you have the chance to rediscover something that once brought you so much joy, why wouldn’t you take it?